Talking about money can be slightly uncomfortable at best and gauche at worst. That doesn’t change the truth that money is what pays the mortgage, puts food on the table, puts our kids through college, buys cute shoes, and funds the building of orphanages. No matter our individual definitions of success, or whether or not we feel intrinsically motivated by money, we all need our businesses to make money in order to pay for the life we want to live. At the risk of sounding gross, I am going to be ultra transparent and tell you exactly how I calculate my speaking fees. This may make some of you uncomfortable, so consider this a heads up if you want to click your browser tab closed and scroll through pretty images on Instagram instead. Speaking fees in the wedding industry are often shrouded in mystery and, quite frankly, are usually numbers just pulled out of the sky. In addition, most wedding conference or workshop producers don't have experience doing corporate event planning, so they don't necessarily know how to appropriately budget for their conferences or for their speakers. This can cause sticker shock, hurt feelings, and resentment for both speakers and conference producers alike. It doesn't have to be this way. LOSS LEADER: This means the person will speak for free or for a non-competitive rate (AKA so low others can't compete with it) in order to gain potential sales in another area of their overall business model. Examples of this would be a graphic designer wanting to get in front of potential new clients, a photographer promoting a new online course, or a wedding planner who has a book coming out. This can be a very effective way to build your speaking resumé, get your name out to the industry when you're in the launch years of your business, or to strategically align with companies you want to work with. FLAT FEE: This is a flat number that the person is willing to speak at an event for. Usually these are increased each year, so a person's speaking fee for 2019 would be more than it is right now for 2018, which is more than what they were charging last year. Some people also have one flat fee for speaking engagements within their country and a different flat fee if the event is international. Flat fees for speakers in the wedding industry typically range from $500 – $50,000+. PER PERSON FEE: This type of fee is calculated by the number of attendees, meaning the price for speaking at a conference with 400 attendees would be more than an intimate retreat with 40 attendees. In a sense, this pricing model is similar to the concept behind royalties for book authors or residuals for TV writers and actors: the more people who consume the creative product, the more the creators of that product get paid. HOURLY RATE: An hourly rate (AKA billable hours) takes into account all the hours involved in preparing and delivering a speech: the time on stage, as well as any research, writing the presentation itself, practice and rehearsals, travel time to and from the event, etc. If preparing for a presentation requires a lot of time away from the work of your core business, an hourly rate can help you make up whatever money you're not making when you're unable to use that time for site visits or creating event design concepts. DAY RATE: For this pricing model, the speaker calculates how much a day of their time is worth, and charges accordingly. For example, if a conference wants a speaker to be present for the full three days of the event, mixing and mingling with attendees, the speaking fee would be the day rate multiplied by three. Some speakers also include travel time away from the office, so a 3-day conference might be quoted a fee based on four or five days, depending on how long it takes the speaker to get there, door-to-door. "EFF IT, I’LL DO IT” RATE: This one is super controversial, but it gets used, so we'll talk about it: if a person really doesn't want to say yes to a speaking invitation, there is sometimes a price at which they're willing to say, "Eff it, I'll do it." $1 million was this planner’s “eff it, I’ll do it” number for a crazy client she did not want. An aside: I’m a capitalist, but if for every speaking engagement you’re quoting an “eff it” price, it may be a sign that you really just hate public speaking and should possibly explore another career path that brings you more joy and gets you paid a reasonable amount more consistently. The pricing model you choose should be based on what best serves your business model. It is different for everyone, because everyone has different strategic goals. I calculate the financial value of my content for one attendee. I choose to err on the side of being conservative in this estimate, and my time frame is generally one year – a reasonable amount of time for an attendee to go back home, implement what they’ve learned, and start to see some results. I then multiply that number by the number of expected attendees. I then divide that number by 25. The final end number is my base fee. For the sake of round numbers and simplicity, let’s say it’s a conference for wedding planners and the average planner in attendance charges $5,000 for full planning. The conference has 100 attendees and the producers want me to speak in a general session for an hour or less. I’ve determined that if each planner in the room takes all the information I share in this particular presentation and implements it, they will book X amount of weddings over the next year. For this example, let’s be ultra conservative and say it’s one additional $5,000 wedding on top of what they normally book. This means that the value of my information to the entire room is worth $500,000. If every single planner sells an extra wedding at $5,000 each because of what they learned from me, they'll have collectively brought in an additional half a million dollars in revenue. I then divide that $500,000 by 25. Why 25? Because on average, only 1 in 4 conference attendees go home and actually implement what they learned from any of the speakers. To get the per person fee, I divide the $20,000 total by the number of attendees. This means my base fee that negotiations start at for that conference is $20,000, which works out to $200 per person. A Splendid tip: If you choose to use this pricing model and want to lessen potential sticker shock, include the per person price in your fee quote. It’s much easier for a conference producer to wrap their head around $200 out of every $3,000 attendee registration fee than it is to only see a big five-figure number on a page. The per person price also allows them to think more clearly about their conference budget. The initial fee agreed to and listed on the contract is the minimum rate, so if fewer people register than expected, the conference isn't entitled to a partial refund from me. Preparing a compelling and relevant presentation is my responsibility. Conference registration sales and marketing is their responsibility. As far as scope creep is concerned, if the conference decides to open its doors to more people after the contract is signed, I would be owed an additional per person fee (at the contracted rate) for every 25 attendees beyond the original estimate. Remember, the theory behind this model is that the more people who benefit from or consume the content, the more the creator gets paid. This also allows me time to do the extra homework now required by the increase and protects against any potential bait and switch, such as a conference quoting a lower attendee number in order to pay me less. I chose to set the scope creep number at increments of 25 people because I felt that was fair to both myself as well as any conference producers. Using our running example above, if the conference sells three extra tickets, I'm not going to bill them for $600. And if they sell 149 tickets, they still get me for the price of 125. No one likes to be nickeled and dimed. The expected audience for the conference and what level the attendees are at in their careers. I also consider which industry segments will be included in the audience. In the example above, I used wedding planners charging at the lower end of mid-range pricing for flat rate, full-service planning. That is obviously not going to be the audience for every conference or workshop I speak at. Different audiences get different presentations because they have differing needs and differing business models. Which means my per person fee will be different for each conference. For example, an audience of bridal store owners who target the mass market with attainable price points for their wedding dresses (say $1500 or below) would change the calculations when it comes to what the information I provide would conservatively add to their annual revenue. Please don't click out of this post thinking I charge $20,000 or more for every wedding industry speaking engagement. It doesn’t work that way. I also determine the value of the content based on the feedback I get and the stories that previous attendees have told me about how their respective businesses improved because of what I shared from stage. Every single piece of feedback I receive, verbal or written, gets entered in a spreadsheet on Google Drive, so I literally have years and years worth of data and measurable outcomes to evaluate. 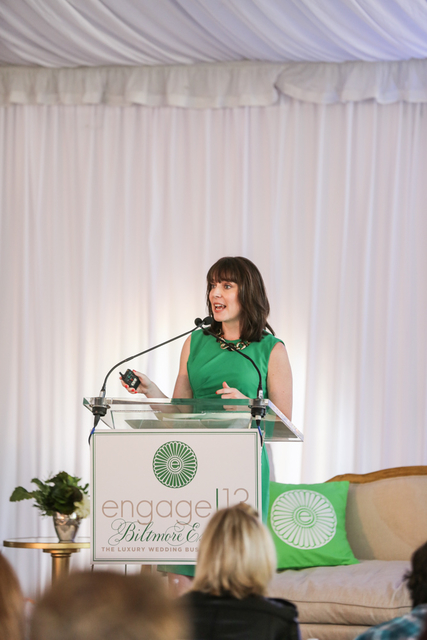 When an attendee from one of the Engage Luxury Wedding Business Summits I spoke at told me that my presentation changed how they pitched a corporate client and it landed them an 8-figure multi-year contract, I entered that into the spreadsheet. I am known for giving presentations with a lot of actionable content that can be implemented almost immediately. I know how the strategies I share can change a person's business, which makes doing the math on it easier. My talks are typically not the ones with the story of my life tied to larger universal lessons that make people cry. While I am occasionally asked to share my personal story, and it does tend to leave attendees inspired and motivated, it contains far less immediately actionable content. There is definitely financial value in the more inspirational-style speeches, since big ideas are born out of inspiration, but it is much more difficult to measure how that will affect specific financial change in an attendee's business. A Splendid tip: If you tend to mainly give inspirational talks and find calculating attendee ROI difficult to do in a fair way, a flat fee may be a better pricing model for you than a per person model. While I don't charge an hourly or daily rate for speaking, I do feel the number should be fair with regard to the amount of time I put into a presentation. A lot of people view speaking as less than an hour of work because they judge it by the amount of time you spend on stage. In reality, it’s so much more, and in my case more than the average speaker. Think about it this way: is the total amount of time you work on a wedding only 8-12 hours on the day-of? Of course not. I don’t give canned speeches. Every presentation is written for the particular conference or workshop I’m presenting at, with the specific audience in mind. When I say specific audience, I mean specific. I go through the entire attendee list ahead of time (yes, even for conferences with 500+ attendees) and look up every single person’s website and all of their social media. I look at any WeddingWire, The Knot, Google, or Yelp reviews they may have. I make notes in a spreadsheet. I study those notes. When I walk on stage, I know exactly who is in that room, what they do, their aesthetic, their point of view, as well as how they feel about pumpkin spiced lattes, their thoughts on the latest episodes of Ozark or Insecure, and whether they prefer SoulCycle, Pure Barre, or Cross Fit. I prepare for a speech like it’s my job, because it is my job. At the conference or workshop itself, I generally stay up late, hanging in the hotel lobby, letting attendees pick my brain as well as giving bossy, unsolicited business advice based on the hours of Insta-stalking noted above. Part of the value conference producers see in me is the off-stage time I’ll put in with their attendees at their event. As an introvert, I know I can only healthily do this if I leave alone-time margin in my schedule the day after an event ends so I can appropriately recharge. My fee needs to be a number that allows me to do this. If you’re an extrovert who draws energy from being around people, you may be able to jet off to an important meeting the next day, fully charged, and not need the alone time. If I priced myself low in order to compete on volume, I would burn out trying to meet my financial goals. I’ve burned out before. It is hell. The recovery process is long and hard. I’m never going back to that. This means that if I calculate a speaking fee and it comes in below a certain number, I turn it down. Both my well-being and my business model depend on this guideline. You know best how you are wired and what you personally need in order to run at full capacity, so make sure your business is designed in a way that allows you to thrive not just financially, but emotionally, mentally, and physically as well. It is not greedy to charge money for speaking, just like it is not greedy to charge money for photographing a wedding or for designing invitations. It is a job, and if you choose to add it to your business offerings, it should be treated like a job. Choose a pricing model that works for you and charge appropriately. The Well-Paid Wedding Pro: Profitable Pricing Strategies, a new Splendid Guidebook for wedding professionals covering all things pricing, comes out November 1st.